Egypt’s Minister of Tourism Rania El-Mashat says that the tourism sector’s growth rate has rapidly increased, recording 16.5 percent, which exceeds the international average, the minister said during the Technological Innovation in Tourism Forum, which is held as part of the UN World Tourism Organisation’s meetings in Cairo. The minister said that she has presented the ministry’s strategy of developing the tourism sector in the country before to the executive council of the UN organisation. 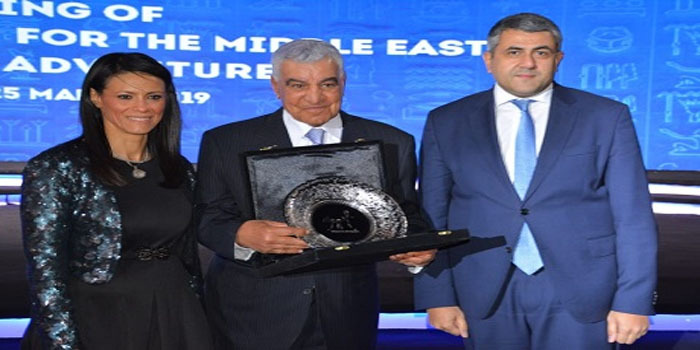 For the second consecutive year, Egypt is hosting the UN World Tourism Organisation’s meetings of the Middle East Regional Commission, held in Cairo under the auspices of Prime Minister Mostafa Madbouly. The minister highlighted the importance given to developing the tourism sector, represented by President Abdel-Fattah El-Sisi’s meeting with the Secretary-General of the World Tourism Organisation Zurab Pololikashvili on Sunday. During the opening session of the UNWTO Middle East Regional Committee meetings on Sunday, El-Mashat stressed the importance of keeping pace with trends in the tourism industry, which is a cornerstone of the structural reform programme launched by the tourism ministry for the development of the sector, adding that empowering women and encouraging innovation is one of the main objectives of the ministry’s plan, along with the participation of the country’s youth. El-Mashat highlighted the ministry’s vision to achieve sustainable tourism development in line with the sustainable development goals of the UN. “The ministry aims to have at least one member of every Egyptian family work in the tourism sector, directly or directly,” El-Mashat said. Recent research by the World Travel and Tourism Council (WTTC) said that travel and tourism in Egypt grew by 16.5 percent in 2018, much higher than the global average of 3.9 percent. According to the WTTC, the country’s efforts in improving security infrastructure have paid off, leading to an increase in visits that is the highest since 2010. The WTTC’s 2018 research, which compared travel and tourism sectors in 185 countries, also showed that travel and tourism are responsible for 9.5 percent of all of Egypt’s employment, providing 2.5 million jobs. The travel and tourism sector also contributed 11.9 percent to Egypt’s GDP in 2018 and is expected to grow a further 5.4 percent in 2019.